Answer: Spark Plugs — In these types of engines, a spark plug (a very large one) is vital to the performance of a function occurring in the combustion process. In a lean burning engine, pre-mixing of air and fuel occur before entering the cylinder head where the spark plug is located. To prevent knocking or misfiring, the combustion process taking place in the chamber must be controlled within a narrow operating window. 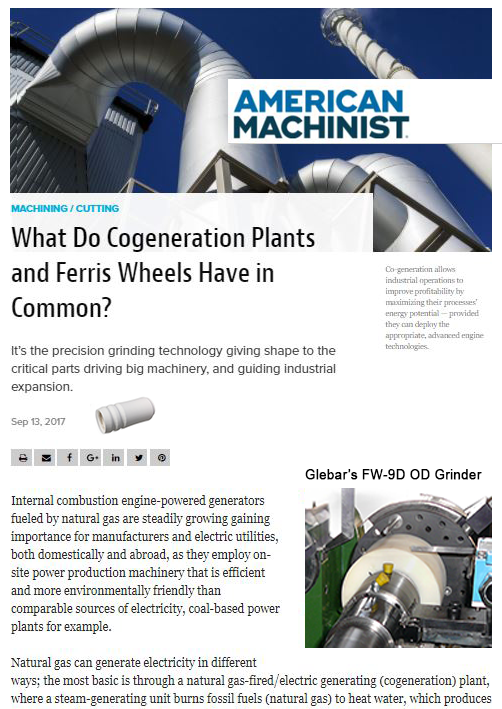 Glebar’s FW-9D Ferris Wheel concentric (OD) grinding machine is the right fit for this component for a variety of reasons. The insulator bodies found in these types of engines are much larger than traditional spark plugs (found in commercial automobiles for example). The manufacturing cost for retooling a high production line is normally reserved for high volume standard plug sizes for smaller engines. Glebar’s machine could be simply configured for a longer part and larger part, capable of shaping a pre-fired ceramic blank up to 8” in length." Vital to the configuration of any spark plug is the proper manufacturing of the ceramic insulator body component. Likewise, large spark plugs require these ceramic insulators to make them function properly. Spark plugs are exposed to over 40,000 volts during ignition. They need sufficient insulation capability as temperatures in excess of 1,000 degrees centigrade is crucial. They also need to be pressure and gas tight in the combustion chamber and withstand pressures over 1,500 psi with vibration in an engine.